We’ve written a great deal about LEED construction of sports stadia and arenas in the first two years of GreenSportsBlog’s existence. But we’ve yet to interview a sports architect, one of the folks who designs such a stadium/arena. Until now, that is, as we feature our interview with Chris DeVolder, Sustainable Design Leader for Sports and Recreation at HOK of Kansas City, one of the world’s leading sports architecture firms. GreenSportsBlog: HOK is the Gold Standard of sports architecture firms and of green building. Does HOK only design sports facilities? CDV: Yes, we’re exploring and innovating in terms of sustainability across all of our market segments, which helps to inform each other and raise the quality of our designs. But the high profile nature of sports gives our brand tremendous awareness and exposure. When prospective clients get up in the morning and hear us mentioned on ESPN or read about us in the sports section, that can only help our business overall. GSB: How did you get involved? Are you an architect who happened on to sports or are you a sports fan who also is an architect? CDV: Definitely the latter. I’ve been a sports architect for 20 years, the last 14 of those with HOK. It a great marriage of two passions for me, sports and architecture. I’m a lifelong St. Louis sports fan–Cardinals and Blues. Also the Kansas Jayhawks. Speaking of KU, my first project was a renovation of Allen Fieldhouse (the legendary home of KU basketball that opened in 1955.) The way I got into it is a great story: In the late 90s I was an architect who also played drums in an irish band in Kansas City. The lead singer (also an architect) and I had the opportunity to design an organic sheep farm (GreenDirt Farm). This project introduced me to the philosophy of sustainability. The lead singer’s name? 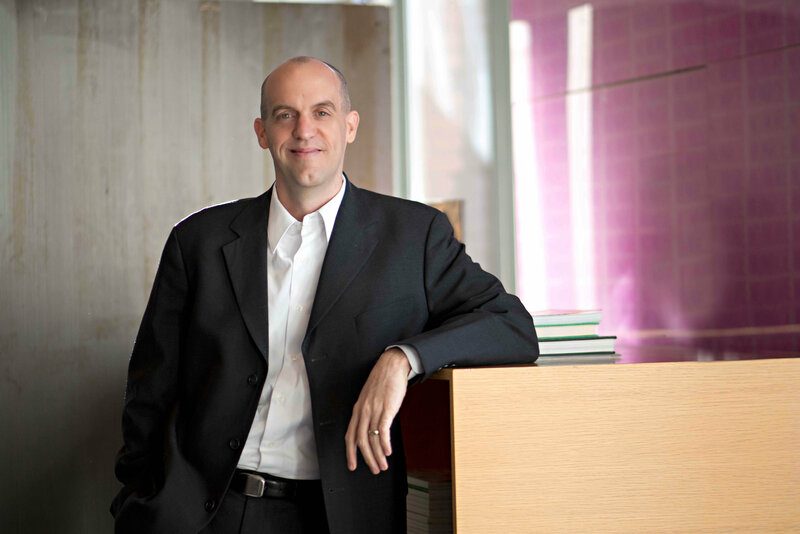 Jason F. McLennan, now CEO of the Living Building Challenge and the International Living Future Institute in Seattle. GSB: That is an incredible story! Are you still in the band? GSB: …I can imagine…Can you share some of the most innovative green stadium projects you’ve worked on while at HOK? CDV: Sure…Let’s start with Husky Stadium at the University of Washington in Seattle. The culture in the Pacific Northwest is, of course, already very green–they get it–we don’t need to explain “LEED” to them. So the project to renovate Husky Stadium, which opened in 1920, with green building principles embedded in its DNA, was not at all controversial. GSB: What did HOK look to do with the Husky Stadium renovation in terms of sustainability? CDV: Sustainability was integral to every facet of the project. First, you have to understand that, even though Husky Stadium is unique in that it sits right on Lake Washington. 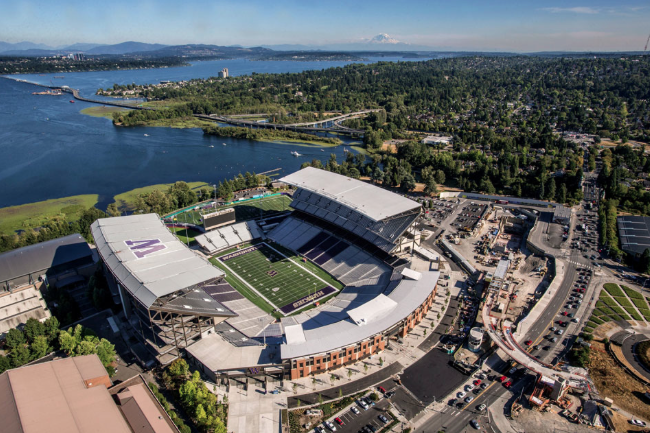 CDV: Absolutely…And so we needed to make sure the renovated Husky Stadium would not impact the surrounding waterways. The project was awarded Salmon Safe Certification–which meant we had to take extensive measures to sure there was no significant pollution during or after the renovation to the Lake. We also reduced water usage in the stadium by 40%. And, this despite the fact the renovated stadium will be used much more often than the original–there will be retail right on site. A sports rehab clinic is there. And, light rail was extended to the stadium–we didn’t design that–but we did coordinate with Sound Transit. Thus the retail space in the stadium, used every day for the commuters, a win-win for all. GSB: A greener stadium for a very green area! Closer to my home in New York City, you worked on MetLife Stadium, which opened in 2010. It is, of course, home of the Jets and Giants and also the site of Super Bowl XLVIII. I was surprised that they didn’t go for LEED Certification. Why? GSB: …I read that there were some very unusual aspects to the stadium’s greenness related to the fact that two teams, with two color schemes (Jets green and white, Giants blue and red), call the stadium home. CDV: Correct. For example, the energy efficient LED lights are green and blue, so both teams fans feel like the stadium is theirs. Instead of having to build and operate two sets of retail stores for the two clubs, we designed stores with merchandise displays that operate on swivels. When the Giants are home, the Giants merchandise is displayed. After the game, and with a Jets game upcoming, the workers simply swivel the displays to the Jets green merchandise. And with LED lighting in the team store the color is switched from blue to green. Another win-win solution that saves space, materials, and energy. GSB: WOW! It’s like the BatCave! Going forward, where does green sports architecture need to be in 3-5 years. CDV: I think we first need to take a step back and look at a stadium as not just a building but as part of a neighborhood. CDV: An example would be capturing rainwater at the stadium or arena and then distribute it to the community, to irrigate a park. Or, say there’s a small arena with a hotel attached. Arenas generate heat–use the waste heat to heat the water in the hotel. GSB: …but the integrated approach can be simple and cost effective and environmentally sustainable…Win, win, win, right? CDV: That’s the way we look at it.